The SuAsCo CISMA (Cooperative Invasive Species Management Area) is a partnership of organizations that intend to manage and control invasive species defined by the geography of the Sudbury, Assabet, and Concord (SuAsCo) watershed. 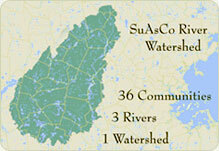 Thirty-six towns are part of the SuAsCo Watershed, and we are all connected by the Sudbury, Assabet, and Concord river system. The watershed covers approximately 377 square miles and includes a variety of upland habitats, wetland habitats, historic sites, scenic sites and recreational areas. The towns, state and federal government agencies, and environmental organizations that hold land in the watershed all share an interest in the work of the CISMA. Any plant or animal that is not native to an area. Able to reproduce without any natural checks on population growth and can out-compete native organisms. Invasive species begin to fill the ecological roles of native species and in short order can entirely replace native species. In April 1999 Congress designated 29 miles of the Sudbury, Assabet, and Concord Rivers as Wild and Scenic for their outstanding ecology, history, scenery, recreation values, and place in American literature. 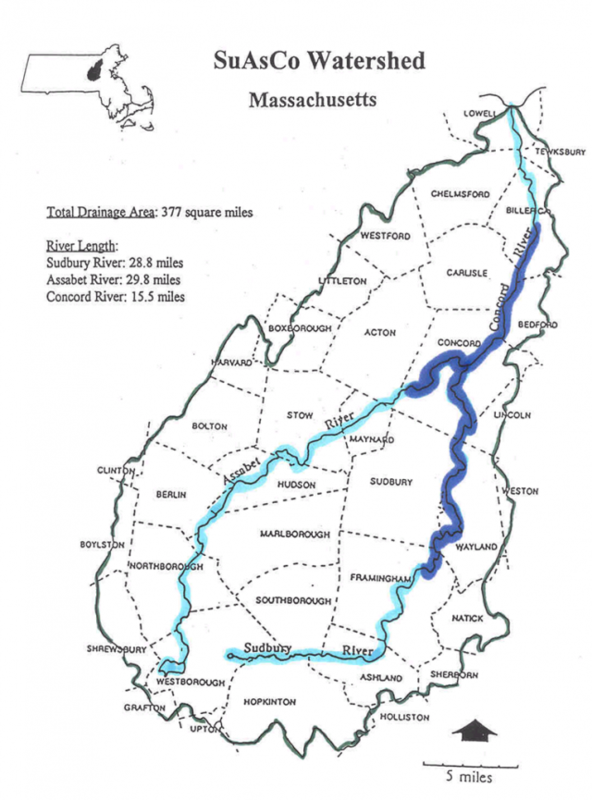 The designated reach includes: the 14.9-mile segment of the Sudbury River beginning at the Danforth Street Bridge in Framingham, downstream to the Route 2 bridge in Concord, and the 1.7-mile segment of the Sudbury River from the Route 2 bridge downstream to its confluence with the Assabet River at Egg Rock; the 4.4-mile segment of the Assabet River beginning 1,000 feet downstream from the Damonmill Dam in West Concord, to its confluence with the Sudbury River at Egg Rock in Concord; and the 8-mile segment of the Concord River from Egg Rock at the confluence of the Sudbury and Assabet Rivers downstream to the Route 3 bridge in Billerica. Designating a river as “wild and scenic” does not halt use of a river; instead, the goal is to preserve the character of a river. Uses compatible with the management goals of a particular river are allowed; change is expected to happen. However, development must ensure the river’s free flow and protect its “outstandingly remarkable resources.” The intent of Congress was to create a national system of protected rivers that co-existed with use and appropriate development. Each river designation is different, and each management plan is unique. Over 156 rivers in the U.S. have been given the Wild and Scenic designation. To learn more about Wild and Scenic Rivers Act and the SuAsCo Watershed, please visit The Sudbury, Assabet, and Concord Wild & Scenic River Stewardship Council.